Yoga is a priceless treasure now accessible to all. While its origins are in the East, it is quickly becoming a part of Western culture. Although perceived as modern in the 21st century, yoga has been time-tested for thousands of years and has proven to be an extraordinary means to achieve physical and mental well-being. Yoga asanas are safe and effective for people of all ages. Yoga is the perfect complement to any other form of exercise or sport, as it tones, stretches, and strengthens both the internal and external systems of the body. And yoga meditation provides a pleasant solution to the stress that so often fills our lives. Beginners Workout is designed for beginners and for those who haven't exercised for a while. It's also good for those who want to take a break from their more strenuous workouts but still want to exercise. You'll learn easy ways to loosen stiff joints, strengthen your abdominals, firm your buttocks, and calm and tone your nerves. 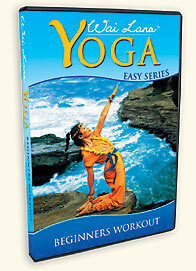 The last asana on the DVD is Yoga Nidra, a very effective way to achieve complete relaxation. The Beginners Workout contains 16 yoga techniques. Toning Workout starts with an energizing breathing exercise that gets you ready for the exercises to follow. You'll practice over 15 different postures and exercises that will tone various parts of your body. You will tone your thighs and buttocks, increase the flexibility of your spine, strengthen your lower back, and stretch your hamstrings. This Relaxation Workout leads you through exercises that will loosen up your muscles, leaving you relaxed and refreshed. In addition you will learn to let go of stress, massage your entire spine, increase flexibility in your elbow and shoulder joints, and strengthen your thighs, abdominals, and lower back. The Relaxation Workout will help you relieve tension with gentle bending and twisting accompanied by coordinated breathing. And the musical meditation ending the session is just the thing to soothe your jangled nerves. Each workout comes with a beautiful full-color companion booklet featuring photographs and key benefits of each pose, as well as safety guidelines for yoga asanas, tips for practicing yoga asanas and preparatory poses. "Good basic instruction, a beautifully filmed location, serene, lovely original music, and adorable yoga teacher Wai Lana ... make this an outstanding solid addition to any library wanting to firm up their exercise collection." These series makes the health-giving practice of yoga easy and accessible to all. Affordable, great for traveling, outdoor-indoor home yoga practice and mindful gift-giving!